Design for social change. The more I tinker with design, the more I believe in its power to create positive social change. Even as we sift through the wicked problems of today, design is uniquely capable of making sense of complexity and finding nuanced intervention points for impact. My thesis explores how design can bolster social capital in fragmented urban neighborhoods. Social capital – defined by Robert Putnam as the commodity of trust, reciprocity and respect between people – is a vital component for neighborhoods to be self-sustaining. However, in the Brooklyn neighborhood of Bed-Stuy in which this thesis is focused and I reside, the rising gentrification breeds a de facto culture of in-group silos. 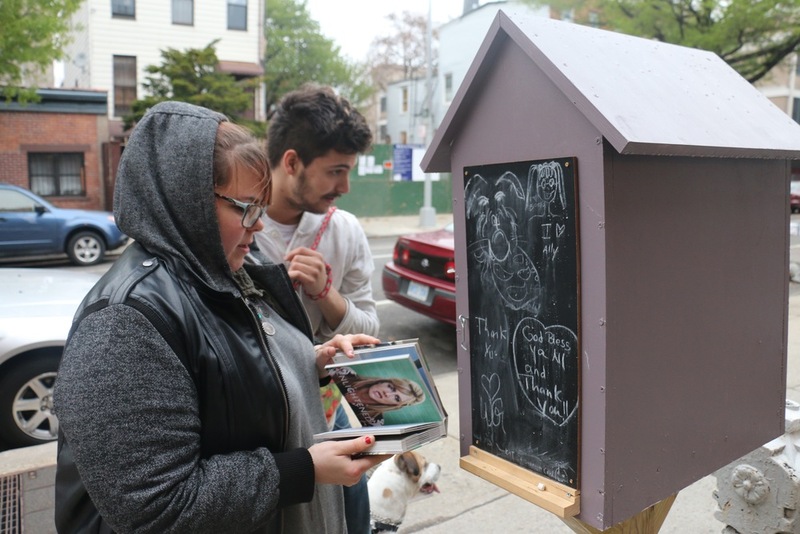 My thesis uses the physical form of a Little Free Library to leverage designed strategies for creating space and opportunity for trust and reciprocity. My hypothesis is that if a neighborhood is entrusted with engaging with artifacts that are left outside at all hours of the day, then heightened trust and reciprocity in the neighborhood will follow. Various designed components leverage engagement from the library, such as: branded labels for the book spines so users are reminded of the source of the books, bookplates inside the front covers posing questions about the neighborhood, promotion of a neighborhood tool library, and installation of a chalkboard to encourage passive dialogue. 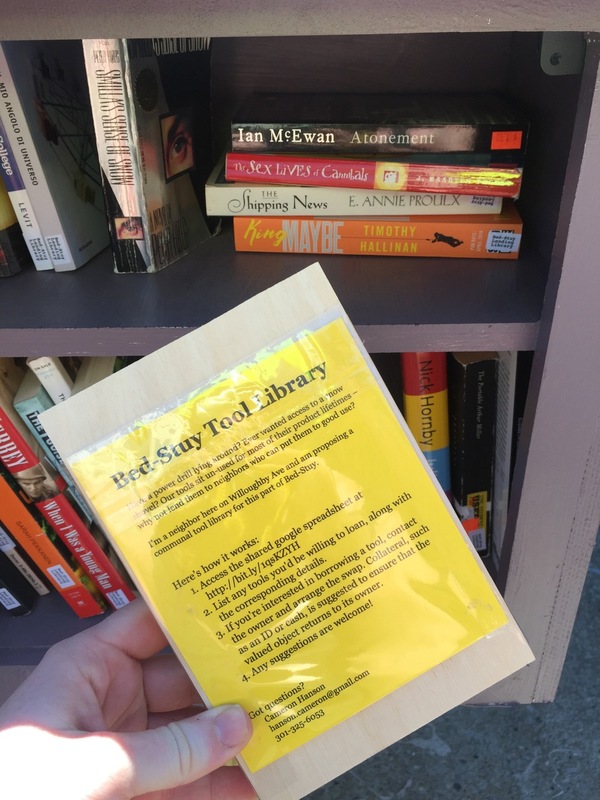 In the course of the two months that the pilot library has been installed, there has been a marked increase in engagement from the neighborhood. Book inventory has been at an almost constant flow, Instagram and Facebook commentary shows that people value what the library represents, and conversations with people on the sidewalk solidify an appreciation for the structure. While only time can tell if this sentiment truly translates to heightened trust and reciprocity, this project achieves its hyperlocal pursuit of micro change. Initiated in Summer 2015 as a Summer Design Researcher within the Department of Innovation and Design in the NYC Mayor's Office of Operations. The city of New York offers an immense depth of public services to its citizens, especially the most vulnerable. But how are people made aware of their eligibilities and how do they access these services? The NYC Mayor's Office of Operations manages the web platform ACCESS NYC as a one-stop destination to learn what services are available to a user and to streamline the application processes. As an independent contractor, I spearheaded the user testing and design research to gain insights and develop recommendations for the www.nyc.gov/accessnyc website. I investigated how people seek public benefits, particularly through on-site research of food stamp centers and phone interviews with community-based organizations. In addition to field research, I led the internal policy and web development teams in debriefing sessions and produced a final report of best practices and recommended improvements. The organization GOOD established a make believe holiday called Neighborday in order to encourage people to go outside their comfort zones (emotionally and physically) and meet their community. I absolutely loved the idea and led two initiatives in April 2013. One was a block party at my apartment where I literally knocked on unknown doors. 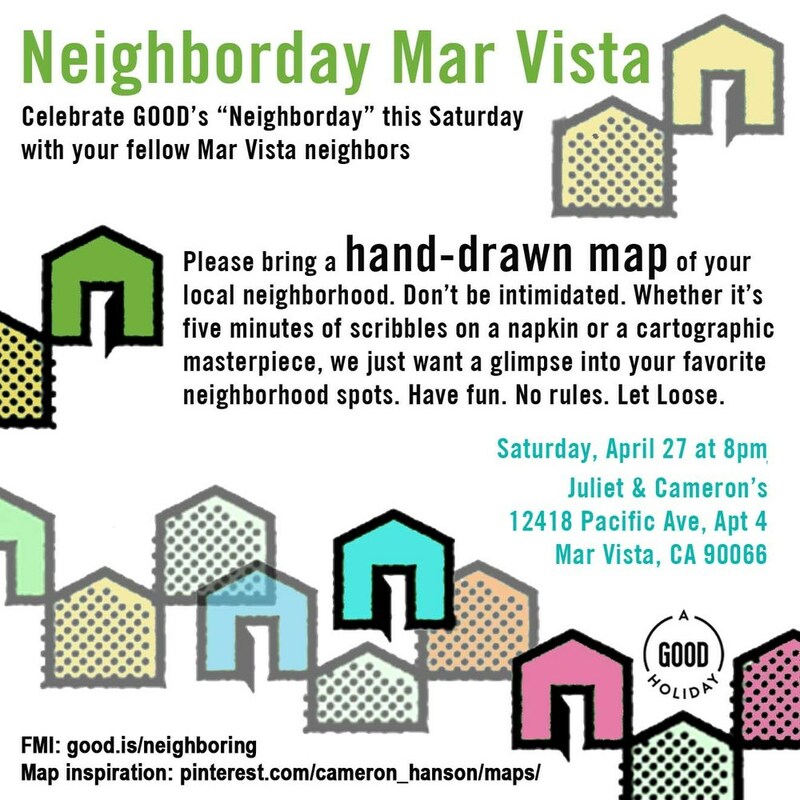 At work, I encouraged people to hand draw maps of their community. Both events gathered submissions upwards of forty! I designed a series of postcards and flyers, as well as personally knocked on strangers doors to invite them to participate.